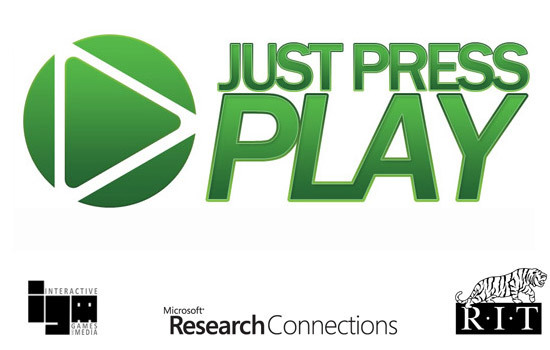 Just Press Play launched on Oct. 13 in RIT’s B. Thomas Golisano College of Computing and Information Sciences. The project was developed by the university’s faculty, staff and students and funded by a $350,000 grant from Microsoft Research. Using a radio-frequency identification swipe card, commonly called RFID, a randomly chosen student launched Just Press Play on Oct. 13 in RIT’s B. Thomas Golisano College of Computing and Information Sciences. Funded by a gift from Microsoft Research and developed by the university’s faculty, staff and students, the project introduces a game layer to enhance the student experience. Microsoft is teaming up with RIT’s School of Interactive Games and Media as part of the company’s Games for Learning Institute, whose mission is to study and create games that are fun, educational and effective. The game system will help college students navigate the barriers to academic and social success by introducing a video game that overlays their day-to-day activities. “The system will create a successful student both academically, through engagement with the facility and staff, and in the real world when students start their careers,” explains Justin Schwartz, a game design and development graduate student at RIT and technical lead for Just Press Play. The launch included remarks from RIT officials and a video presentation promoting the game. Developers showed off trading cards created for the game, equipped with individual codes needed to complete challenges. The launch was also streamed live to project partners at the University of Wisconsin, Teachers College at Columbia and New York Law School. Students in RIT’s School of Interactive Games and Media will be the first group of students who are eligible to play the game. The game will then be introduced to students at the partnering schools. “We hope that what we learn in this first experiment will have broad application at both the collegiate level and throughout K-12,” says Andrew Phelps, professor and founding director of RIT’s School of Interactive Games and Media. Microsoft’s gift to Just Press Play is only the latest investment in its relationship with RIT’s School of Interactive Games and Media. Microsoft has donated more than $1 million in support of game design and development education, which began at RIT 10 years ago.